This baseball tin is definitley a "Grand Slam". The metal baseball shaped container is also a bank. 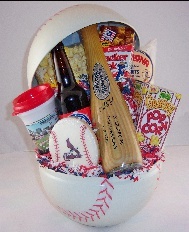 Filled with all your favorite ball game snacks. soda pop, and a Cardinal's soft baseball.